How to Recover Deleted Files on Samsung Galaxy S8/S7/S6/S5/S4? Just image that you received an important text on your Samsung phone, and you haven't had time to look it over but accidentally deleted it from the phone by mistake. How badly you want to get it back and read it. In any case, you need the means to retrieve the unread SMS from your Samsung mobile phone. There are many other situations can cause your Samsung data loss, such as phone formatting, ROM flashing, system corruption and so forth. Data loss problem can be a disaster for you. 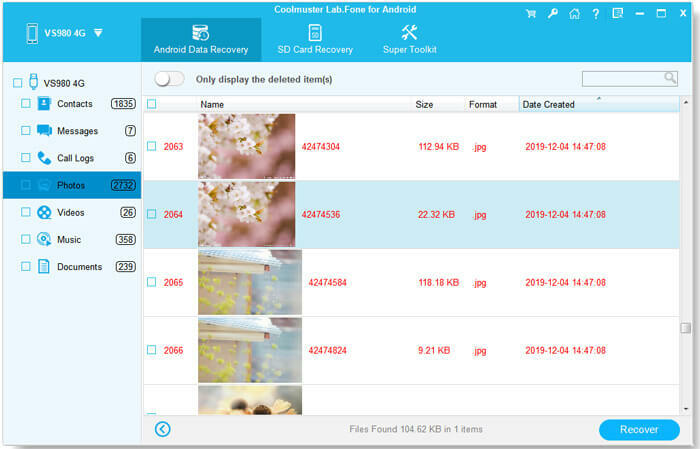 But you don't need to worry, the deleted files are not permanently erased from your Samsung mobile phone. Deletion only mark the storage of the deleted files as blank. You can get them back as long as you haven't used new files to overwrite them. Coolmuster Lab.Fone for Android (for all Windows versions) or Lab.Fone for Android Mac is software you can download onto any PC or Mac desktop or laptop computer with the expressed purpose of retrieving lost data from any type of smartphone or tablet that uses Android operating systems. All the data, including contacts, text messages, photos, videos, music and more will be scanned and displayed on your computer screen and existing and lost data will display in different colors - with lost data in red color and existing data in black - this allows you to easily recover what you want. What's more, it can restore lost data from all kinds of Samsung device like Samsung Galaxy S8/S8 Plus/S7/S7 Edge/S6/S5/S4/S3, Samsung Captivate, Samsung Galaxy Ace, Samsung Galaxy Note and so forth. Note: When you deleted files from your Samsung phone, do not save new files to it, in case of those deleted files overwritten by the new data. And never forget to backup your Samsung phone to computer from time to time. 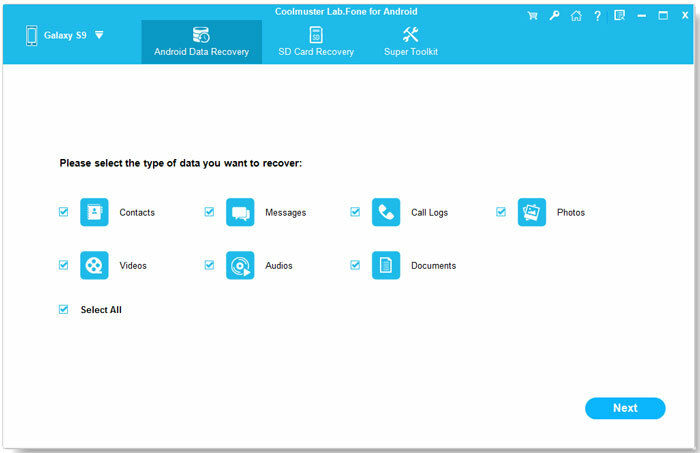 When you have finished to download and install the Samsung Galaxy data recovery software, you can launch it on the computer and connect your Samsung Galaxy S6 to the computer with a USB cable. The software will detect the Samsung phone and you will get its main interface as below. Then you need to enable USB debugging before scanning your Galaxy S6. 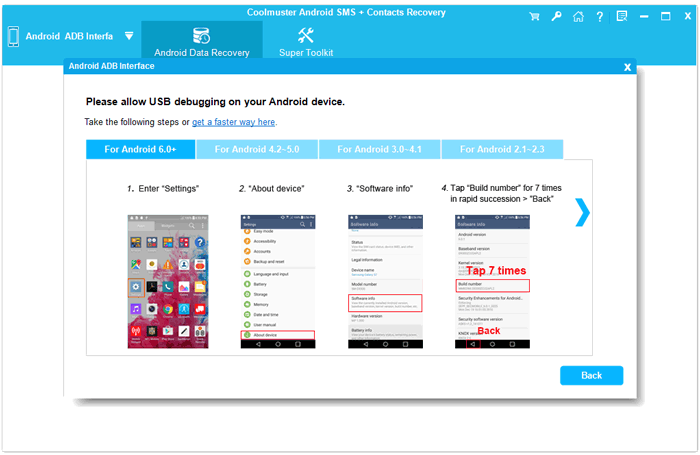 Here are the instructions on how to open the USB debugging on your phone. When you see the above picture on your computer, tick off the "Always allow from this computer" and click Ok button. Then, your Galaxy S6 will be scanned by the software automatically. All the contained files in your Samsung phone will be displayed in clear categories, including text messages, contacts, photos and videos. Open each category from the left sidebar and preview these files in details. Mart those you want to recover and click “Recover” button to save them on your computer. We kindly suggest you not to save the recovered data on your Samsung phone again. Just find another place, no matter your computer or other external disk to save them.